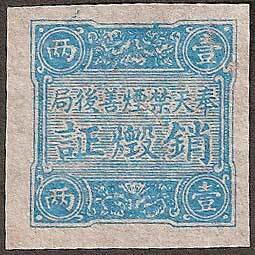 1 Yuan Blue Opium Tax Certificate. Issued between 1927 and June 1928. Opium became illegal in Fengtian from 1907. It was at this time that Great Britain and China signed a treaty preventing further exports of opium by the British and a ban on domestic production by Chinese growers. This did not stop some growers and dealers from operating a widespread and profitable black market. People at every level of society were known to be abusing the drug. Criminals were making a lot of money and the government was very unhappy about this situation. Zhang Zoulin (1875 ~ 1928), the warlord ruler of the three northern provinces, had from an early stage in his career been a staunch supporter of the ban on opium. However in 1927 he desperately needed to raise money in support of his forces who were under attack by the Nationalist Army's "Northern Expedition" led by Chiang Kai-shek. Reluctantly he decided to raise revenue by exploiting the sale of opium in his power base Fengtian province. 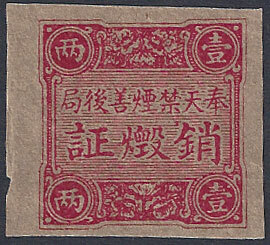 To manage this new tax he established the 奉天禁烟总局 best translated as the Fentian (Opium) Smoking General Bureau led by 马义魁 Ma Yi Kui, a Deputy Secretary for the Police Commissioner. This new organisation was based in his capital Mukden and had offices in every town. The plan was simple, he introduced strict controls under the guise of a new tougher crackdown on the opium trade. He would enforce the ban by the use of financial penalties - these were, in fact, a thinly disguised tax. 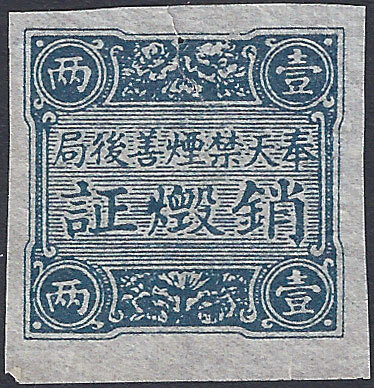 The Fengtian opium traders were quick to realise that the government simply wanted money and so they came forward to voluntarily purchase "Opium Destruction Certificates". Many growers stopped growing opium thinking that a genuine ban was in force, until officials visited them and explained that they continue to grow opium on payment of a 30 Yuan "penalty" per acre or field. To help the crackdown along it is said that seed was even available from the local office. It became a punishable offence to smoke opium unless you were a recovering addict. If you wanted to continue to buy opium you had to claim to be a recovering addict. 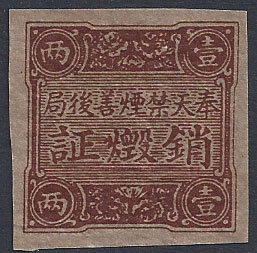 As an addict you had to pay 20 Yuan to buy an "abstain certificate" this allowed you to buy opium for one month. A time limit for recovery from addiction was laid down dependent upon the age of the "addict" however, this was largely ignored so long as the addict could afford to buy another certificate. Pharmacies often provided a special room for the smoking of opium, these were also subject of a special "penalty" which was in effect a license. Some of the poorer people did have to stop taking opium but realistically the whole clampdown was a sham. 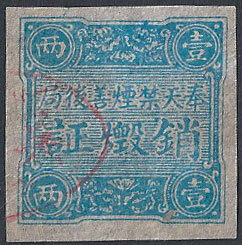 Most forms of taxation at that time involved a tax stamp and opium was no exception. 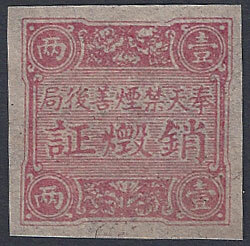 In this instance dealers were charged a penalty of 2 Yuan for each "两" Liang (or Tael), approximately 50g sold. 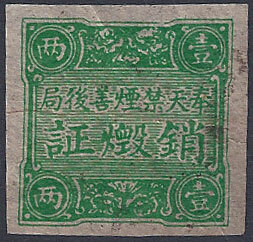 These destruction certificates (tax stamps) are said to have been available in denominations 1 Yuan, 2 Yuan, 5 Yuan and 10 Yuan. 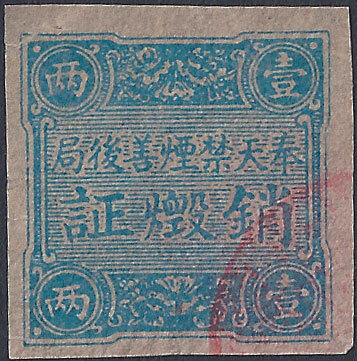 Of these, only the blue 1 Yuan stamp appears to survive, so it is that possible the other denominations were planned but not issued. I have been unable to find any details of these missing values concerning colour or design. Design size 44mm x 19.5mm, Lithographed on thin white un-watermarked paper (possibly cigarette paper). The design features an image of the drum tower gate with sheaves of wheat on either side. 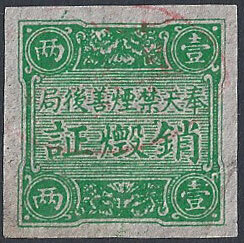 This reflects the style of the municipal revenue stamps issued in Mukden from 1926 until 1932. 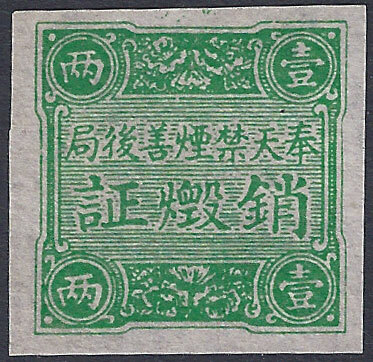 The banner at the top of the stamp reads 奉天禁烟总局销毁证 Fengtian (Opium) Smoking General Bureau, Destruction Certificate, with the value of 1 Yuan shown at each end of the stamp within a circular motif. Allowing the sale of opium led to many members of the workforce becoming addicted and productivity suffered as a result. The policy did not raise as much revenue as expected and Zhang was criticised by both the Chinese and foreign powers for bad policy. 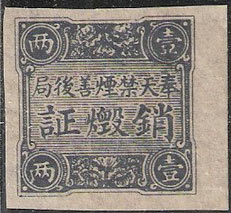 The use of these stamps came to an end when Zhang Zoulin died in June 1928 and was replaced by his son, Zhang Xueliang. He, once again, made the sale of opium illegal and abolished the bureau. Used from July 1928 until March 1929. In June 1928 following the Japanese assassination of Zhang Zoulin, his son Zhang Xueliang came to power. The young Marshall Zhang Xueliang decided it was time for a proper clampdown of the opium trade. To deal with this he established the 奉天禁烟善后局 best translated as Mukden (Opium) Smoking Rehabilitation Council. The man in charge of this organisation was 李蓉镜 Li Rong Jing (1868 ~ 1946) a former clerk of the Higher Public Prosecutor's Office. When the ban on opium was introduced inspectors visited growers and suppliers of opium and issued destruction certificates for all existing stock. 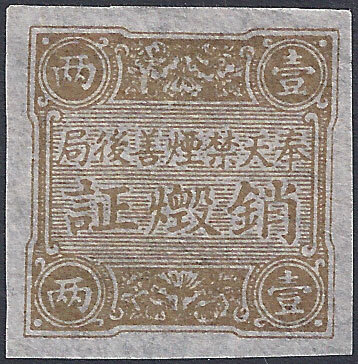 The destruction certificates were free, which is why no value is shown, and attached to every 两 Liang (50 gram) of remaining opium. This was a control measure. Farmers and pharmacists were then ordered not to grow or buy new stock and were given until December of 1928 to sell or use any of the certificated stocks. After December any remaining stock was to be submitted for destruction. 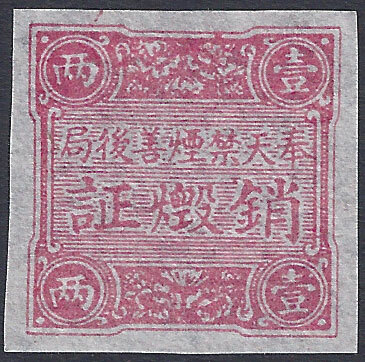 From early 1929 anyone caught growing or selling in opium in Fengtian was severely punished. Below are the Fengtian (Mukden) Opium Destruction Certificates, This is a set of 6 coloured certificates. 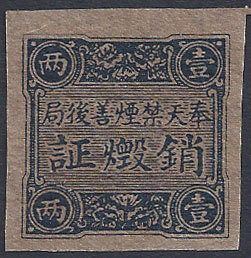 The top row of characters read 奉天禁烟善后局 best translated as Mukden (Opium) Smoking Rehabilitation Council. Below this 销毁证 Certificate of Destruction. 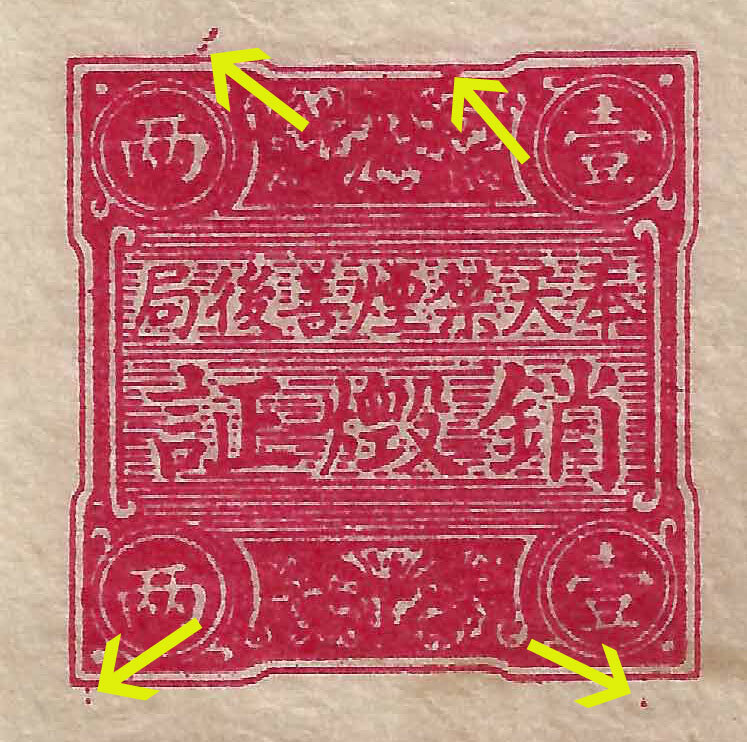 There is no value shown on the stamps, instead is the weight one "两" Liang (50 grammes) which appears at the top and bottom of each certificate. The colours might represent different regions within Fengtian. At this time Fengtian province had been sub-divided into six 州 Zhao, in English the nearest equivalent to this is "State". Alternatively, the colours may indicate a grade or type of opium. If the grades follow tobacco these would be 1st Class red, 2nd Class light blue, 3rd Class brown, 4th Class grey/indigo, 5th Class blue, 6th Class green and because of the similarity in the colours this seems likely to be the case. These colours were consistent when used with cigarettes and cigars so it is logical to assume they were also used for opium. Tobacco had 7 classes, with the 7th class being represented by purple, this class/colour appears to be missing in the case of Opium. This is currently the most popular theory. Design 26.5mm x 27mm, Lithographed on thin white un-watermarked paper (possibly cigarette paper). Always imperf, no gum. 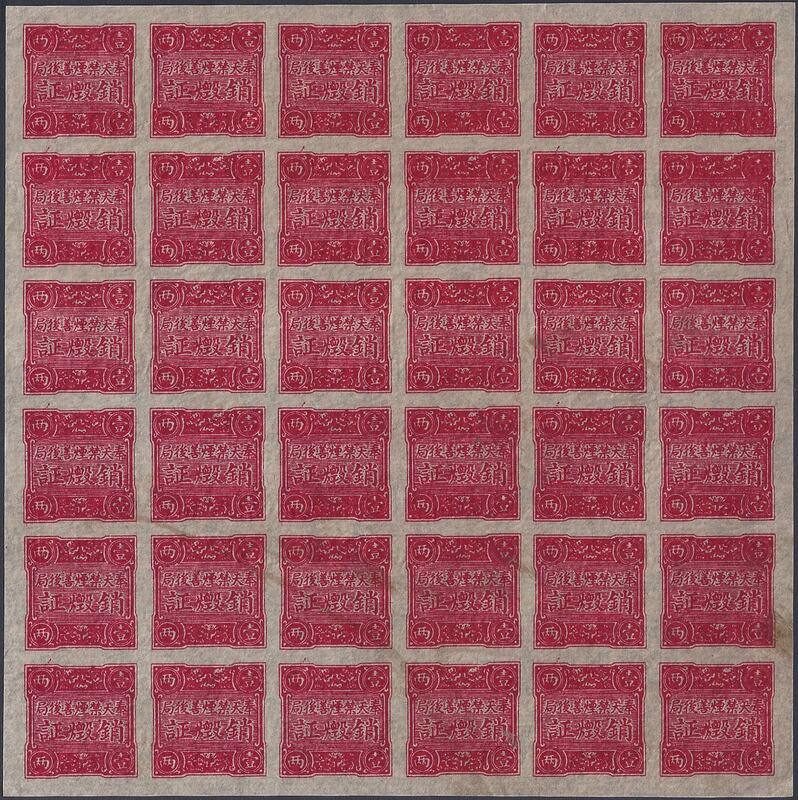 36 stamps per sheet (6 x6), To see an example of a full sheet click here. The paper used is thin and may well be cigarette paper. Paper Colours - White, Buff, Brown. The certificates come in six colours but some of these look very different on buff or brown paper, this has lead to some books listing seven colours or more. It is probable that all colours appear on all papers but I have yet to confirm this - see below. Certificates printed on thin white paper. Certificates printed on thin off white/buff coloured paper. Certificates printed on thin Light brown coloured paper. 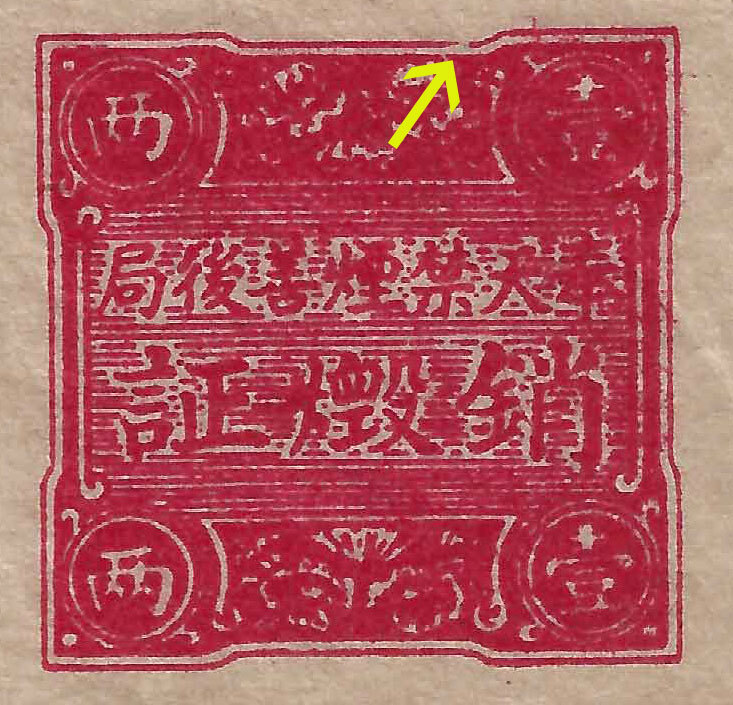 Some stamps are found with a red oval cancel. This is usually feint and unreadable, it may simply be the mark of a retailer or it could be more official. It is probably a readable example of this exists somewhere and when a translation can be obtained it will hopefully answer this question. Sheet position 7, 9, 11, 19,21,23, 31, 33 and 35. Sheet position 8, 10, 12, 20,22,24, 32, 34 and 36. Click to enlarge - these varieties appear on all colours with the exception of the grey. It is possible that the printing started with grey and at some point the cliche of four die from which the sheet is composed was damaged, meaning that later issues had these characteristic marks. Much of the above is based upon a thesis written by Wang Xiang (1979-), MA History, assoc. prof of BOHAI University, 2009, interpreted by another scholar Ge Rong of Changsha.